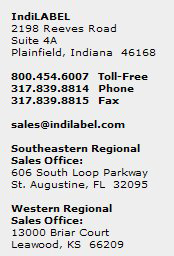 IndiLABEL, LLC a Limited Liability Company was formed on December 14, 1996. Because of growth, we moved to our new expanded location in June of 2010. We have grown from a three person operation to our current status. IndiLABEL® is a converter and printer of pressure sensitive labels and tags, specializing in wide web applications using an array of materials. We offer complete programs from design to production, order fulfillment, inventory control and distribution. Our integrity and personal commitment to quality of product and service to our customers is the hallmark and the foundation of this company. We are in constant pursuit of perfection toward meeting and exceeding the needs of our customers. Over a decade of experience with which to serve you.